Lettuce Harvest was brisk throughout the Salinas Valley over the last week as Lettuce Prices were up due do shortages. Due to excess hot temperatures on the East Coast hurting quality and supply in the area, produce buyers have rung up the sellers in Salinas for some good quality green leaf, and iceberg varieties. “It’s crazy, and definitely unusual,” said Ben Wilson a salesman for Salinas-based Coastline Produce. “On Wednesday most 24-count green leaf cartons were shipping for $13 to $15 up from $10 to $11.50 a year ago,” Wilson said. “On June 22, prices were as high as $20.00 per carton. Demand has been so robust that it has caused a shortage of green leaf and iceberg in the Salinas Valley. “It’s very tight,” said Wilson. 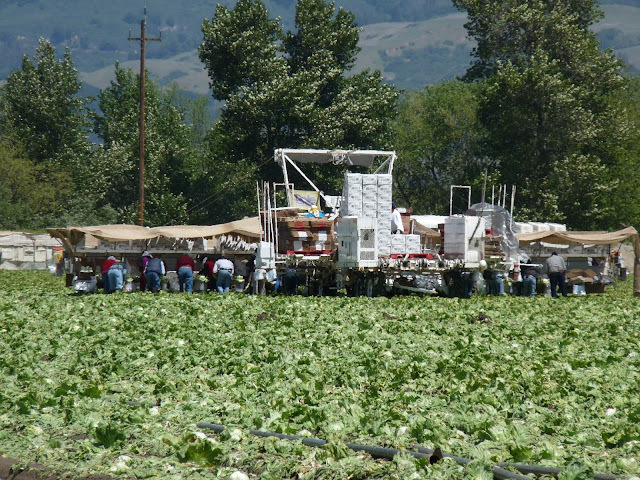 Currently in Salinas, there are many fields of lettuce, but they are still weeks away from harvest.